Empanada Sauces | PAMPEANA EMPANADAS - Seattle and Tacoma's Home of the Baked Empanada! Dulce de leche is a decadent South American caramel, rich, creamy and delicious addition to a number of desserts. Ways that we like to use it: drizzle it over ice cream, spread it on pancakes, bake it into cakes. Or - eat it by the spoonful, it's THAT good! We sell our dulce de leche in 8 oz. containers for $3.99. We bring some for sale to our farmers markets, and you may also order directly from us, just give us a call. Sometimes it's a nice addition to have a dipping sauce for empanadas. There are three that we love - Chimichurri, a very typical Argentine sauce, a Tamarind Ginger, and an Aji Sauce for some roasted pepper flavor! You can order all three from us for $5.99 / 8oz. container, or the recipes are listed below if you'd like to make your own. Serve immediately or refrigerate. If chilled, return to room temperature before serving. Can keep for a day or two, and in fact the flavors intensify a bit if you let it sit for a few hours or overnight before serving. Whisk tamarind into lime juice until dissolved. Add remaining ingredients and whisk until smooth. Refrigerate up to one week. Serve at room temperature. Makes one cup. Preheat your oven to 450�F (232�C) Spread the peppers evenly on a cookie sheet, in a single layer. Roast the peppers for about 4-5 minutes until the skins blister. Watch carefully so they do not burn. Place the roasted peppers in a plastic bag and seal the bag. Allow the chile peppers to sweat in the plastic bag for about 10 to 15 minutes. When you remove them from the bag they will be easy to peel. Rinse the peppers under cool running water. Peel the chile, remove and discard the skin, seeds, and the veins. You may want to leave a small amount of the charred skin for flavor. Wash and dry the onions and cilantro. Remove stems from cilantro. Makes sure peppers are peeled and ready. Roughly chop the scallions and chile peppers, and place them in a food processor or blender with the cilantro leaves. Process in short spurts until vegetables are well minced. Place vegetables in a bowl, and stir in the lime juice, cumin, and vinegar. Season with salt and pepper to taste. 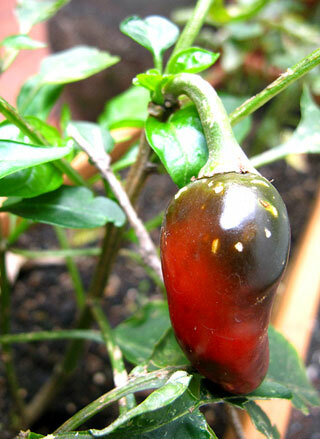 Store aji in an airtight container in the refrigerator.